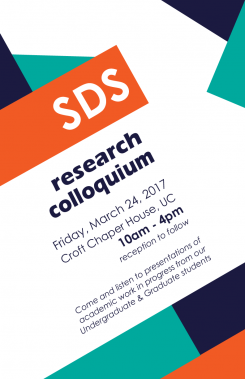 The SDS Student Research Colloquium is a one day event where SDS collaborative graduate students and 4th year undergraduate students will have an opportunity to present their research to fellow students and faculty. All SDS collaborative graduate students in SDS1000 and SDS undergraduate students in SDS458, SDS459 and SDS460 will automatically be included in the colloquium. The colloquium will be held in Croft Chapter House in University College.